I was asked this question by a fellow iPhone user. Although I have set up Gmail on my iPhone, I hardly use it but just now, I checked it to see if there really is no way to sign out iPhone email. True enough, there is no option to do so and I think this is rather risky if we do not lock our iPhone with a password, like myself. 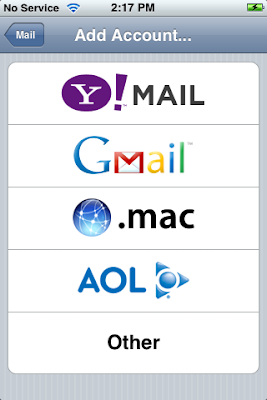 To work around this, if we do not want to use email anymore, just go to SETTINGS –> Mail –> Accounts [Gmail or whatever your account is] –> Account –> and turn it OFF. Once it is OFF, when you access your email via the Mail icon on your SpringBoard, you will see this on your screen. Of course, if you would like to take extra precaution, after turning your email account OFF, delete the password from the Incoming Mail Server and Outgoing Mail Server (SMTP) of your IMAP Account Information. Remember to add in your password and turn it ON again when you want to use it. Yea, I know it’s a little tedious but then what to do when there is no direct option to keep the email logged in or out. If you know of a better way, do share by leaving a comment. Thanks. yes there is a way to sign out…..Go to SETTINGS, then MAIL, then go to the top, right under accounts they will have the name for EX:Yahoo.Then go to delete account and you can just log back in anytime you want. Thanx man, that was really helpful! You can always under stettings mail and the account that you want to log out from, enter a wrong password. Forget the last suggestion. It does not work. Delete the account and add the account if you want to have it on your iPhone. In my iphone, SETTINGS, then MAIL, under accounts all options are inactive, can any one help me out to log out from gmail. I went to Safari and pulled up yahoo, then I went to mail…how do I log out of this email?? I can’t figure out how to do it, I know how to delete email from regular mail but I can’t log off on safari..any suggestions? I had trouble signing out of yahoo on iphone and ipad. Eventually, on the Inbox screen, I clicked on my user name down in the bottom left hand corner, and that brought up the normal Yahoo Sign Out option. Simple. If I want to delete it, it says that all ur photos and documents will be deleted.